The near future. A UFO appears on Earth's orbit. Ignoring all contact attempts, it showers the planet with priceless artifacts. Choose: perfect health, $10 million, or seven years in prison, per the new amendment. The night of the meteor shower, Paul and his friends run around the city, engaging in quick fights with citizens gone crazy, trying to obtain one of the artifacts. But is it really selfless help the mysterious aliens are offering? What awaits a human who holds a precious crystal in his hand? Where will he wake up tomorrow? What if the first thing he sees when he opens his eyes is the blinking line of text "Loading location: virtual training ground Kubinka-Digital. Welcome, cadet! You're now space fighter pilot!"? 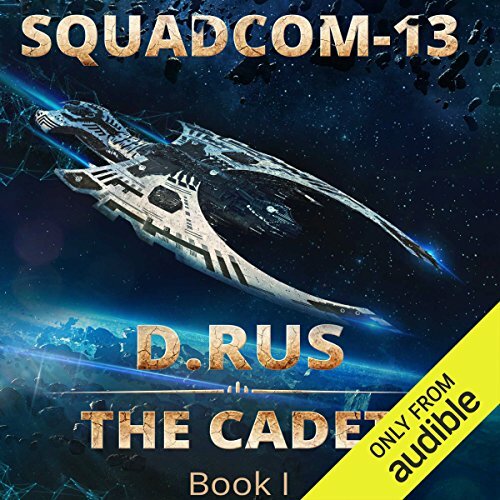 ©2016 D. Rus (P)2017 Audible, Inc.
What would have made The Cadet better? I was very disappointed with this offering by D.Rus, I loved the alterworld books, but this was ...i dont know... either poorly written in hurry up mode, or poorly translated...maybe both. Disappointing, it could have been so much more... the future military almost all female after bio weapons killed almost all males... time traveling to mine the genetic legacy of the past and keep the race going... all patched into a cyberpunk lit rpg book.... it could have been great... I think this one died on the editor and translators pens. Would you ever listen to anything by D. Rus again? What three words best describe Jef Holbrook’s performance? Full of Mary Sue fantasy chauvinistic homophobic rhetoric. Predictable and bland otherwise. Skip this one if that sort of thing bothers you. Narration is horrible. Story is weak. Characters are super weak. Somehow I was even bored during the action scenes. BANG! BANG! BANG! was repeated so many time I couldn't take it anymore. the book was too confusing and fragmented. The solution to all issues seem to be throwing technical jargon. The narrater makes this unlistenable. He speaks way to fast. Good story but narration makes it unlistenable. begins well and the .... idk what happened?!? The book begins well... but when they get into the VR training the second time it's like watching an YouTube video of an MMORPG. 75% of the book is than lost and does not tie in well with the main story. First... the Narrator was a TERRIBLE choice. He speaks with an annoying lisp through the entire story. Second the narrator also tends to sound muffled most of the time. In addition his voice sound like a an overweigh nerd. nothing like the former athlete​ or potential military pilot go is suppose to voice. Then the story plots is annoyingly unclear and uninteresting till the last section, where they team up with sniper company 7. Vastly disappointed in this story compared to his usual writing. I don't really know what to say other then I like what he was trying to do but i just does not have that magic of his other books. Maybe it's that he bogs you down in the minutiae of the world and forgot about character development. For most of the book i was lost. I didn't know or really care where they were going and why they were going there. The whole leveling system in this book seemed overly convoluted and lacked any real in game meaning as to awesome perks and abilities. I really liked the Play to Live Series. This one however didn't have much in the way of world building. To really make a transition meaningful you have to contrast each world type. This one seems to rush into the part they wanted to write about without as much character development or meaningful setting description. After the fairly brilliant "Play to live" series, I thought this might be a nice change in theme. Unfortunately, the story is utterly ridiculous. I wonder why Audible even produced the audiobook, and how the narrator didn't mutiny at page ten.